Many fishing days are cut short, or an angler has to leave a tournament early because of equipment problems. Having a good battery is a necessity when going out on the water. When looking for a trolling motor battery for your boat, you want to consider the battery type, battery amperage hour rating, and your budget. Batteries have the greatest advantage which is; they apply to all devices, whether mobiles or automobiles. Trolling motor batteries are not similar to car or truck batteries since car and truck batteries which have a short-cycle and only need a kick-start to get the engine running in case of emergencies. These are cells which can withstand heavy duties and give a remarkable performance. They wear out after extended use; therefore, you need to be observant when considering which brand to purchase. A boat and jet skis are examples of motors that use trolling motor batteries. 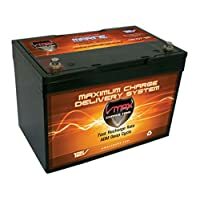 The contexts in TheMarineBattery are usually organized and to the point, but some of you might not have very much time to go through all the reviews that I have provided here. For this, I have created a comparison table consisting of brief overviews of all the best trolling motor batteries. Here, the batteries have been compared according to their category, performance and important features. If you have some spare time to go through the trolling motor battery reviews, then please don’t hesitate to click on the links below. You shouldn’t stress out about finding the right battery. There are three types of batteries for your trolling motor. They are also known as deep cell marine batteries. They are relatively inexpensive and, are tough enough to handle constant drains and recharges. They do require some maintenance, topping off the water. They usually last between 1-2 years. AGM stands for Absorbed Glass Mat. They are built using a glass plate and gel-like substance. They are enclosed so you won’t have to open them up to add distilled water. They cost up to two times more than a wet-cell battery but last longer, usually between 3-4 years. They can last a relatively long life if kept at a temperature of under 105 degrees. They can last up to 10 years, but expect to pay the most money for these batteries. They can cost from anywhere between $850 to $1,500 per battery. Unlike other batteries a trolling motor battery has a thicker grid size for deep cycle usage and help offer better performance. Batteries produce a chemical reaction of sulfuric acid with lead plates to create a direct electric current. After which, sulfates are deposited on the plates, reducing their ability to produce a current.The grids represent how the anode and cathode are aligned. The network of the battery’s grid makes the charges flow to each terminal of the battery. They also have electrolytes in them which cause chemical reactions between the anode and the cathodes. Chemical reactions are responsible for forming the charges which a device using the battery exploits. All these previously mentioned components are placed inside a cell with a strong welded case which makes it durable and spill proof. Amperage hours abbreviated as AH, is a term used to rate marine deep cycle batteries. It tells you how long a battery can supply a constant amperage. If the battery has a higher rating, it’ll have more power to keep your battery running at a given speed. The highest ah rating you should choose depends on the size of your boat and what you can afford. If your trolling motor powers on 12 volts, you will want to find the highest amperage hour rating you can get for it. Because you only have one battery and make sure to run the trolling motor as long as possible without draining the battery. The BCI group size is a term used to indicate the size and power of a battery. There are several groups of cells. Examples of the groups include 6D, 8D, 31, 27 and 24. Group 24 is the smallest and typically used for boats. Also, if you happen to have an old battery box ensure the new one also purchased fits in the box. Finally, ensure that where you place the battery, there is enough room and some ventilation. Electric trolling motors run on 12-volt marine batteries. Series of batteries can be linked together to provide additional power, depending on the model of trolling motor and it’s power. Two 12 volt batteries can link together and add 24 volts to the motor, and three batteries link together to add 36 volts to the motor. Large motors require two or three batteries to meet the demand of 24 or 36 volts for the motor. They also provide more thrust. The longer and more consistently you fish will depend on the size of trolling motor and battery you will need. Have in mind, the purpose of the battery you will be buying before making the purchase. If on a boat, will it be for just cranking the boat? Alternatively, running onboard appliances? Alternatively, perhaps even both? After asking yourself such questions, now select a battery based on its cranking, deep cycle, and dual purpose capability. f) They are durable that the common standard lead acid batteries. It is paramount to cross-check the time of manufacture to help you choose the best one for yourself. This is necessary because the fresh ones are always considered the best. It is advisable not to buy batteries which are over six months old. You can mount the battery in any position; some are waterproof and can even be inverted upside down. These types of features are best for boats. Also, other batteries have thicker plates meaning they can sustain deeper cycles. The best and most recommended brands of trolling batteries. This sealed lead-acid battery doesn’t need any water additions. It can operate at any position and can be used closely with others around. It has higher crank amps, lower self-discharge, greater vibration resistance, heavy-duty and no corrosion terminals. The battery can hold up to 12 volts. It is cheap and the best in the 20-AH category of cells. Regardless of the fact that all batteries get exhausted, the UPG shows its durability and strength since it can last when handled with care. The battery is also spill-proof and is safe for operation. Some customers are saying the value is top-notch. They also say it holds a better charge than other batteries on the market. 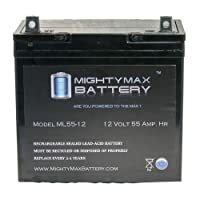 The ML35-12 made by Mighty Max is a maintenance free AGM battery and comes with a one year warranty. This spill-proof battery has a high discharge rate, wide operating temperatures, long service life and deep discharge recover. It is rechargeable, and can be mounted in any position. The Mighty Max ML 35-12 is made to resist shocks and vibration. It has a long lasting, high performance in high and low temperatures. The battery gives a long lasting performance regardless of the temperatures being cold or hot. The battery is rechargeable and can be mounted in any position because it is spill proof and resists unnecessary shocks or vibrations. It can be either an AGM or SLA battery meaning it has a high discharge rate, a wide range of temperatures which it can operate on, a long life and a deep discharge recovery. 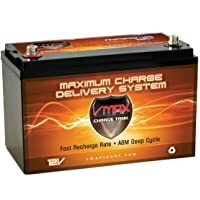 The ML-12 is cheaper compared to other 35-AH batteries. Buyers are saying it’s a high-quality battery for the price. This heavy duty, no maintenance VMAX battery is integrated with AGM and SLA technology that increases performance. It comes with 5-6 years of drift service. It can also be accessorized to make a trolling motor kit. The Grid structure is made up of alloy lead and tin. It is this structure that gives VMAX batteries their high performance and quality lifespan, which can be great even with many discharges. 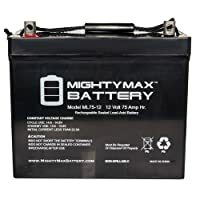 The battery is also a 35-AH but has a better quality that than the one by Mighty Max. The advantage of the battery is that it can serve a broad range of trolling motors. 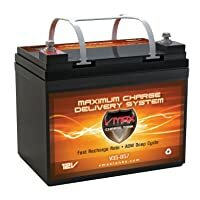 It is a little more expensive than Mighty Max battery and like other good batteries, the Vmax857 also is spill proof. 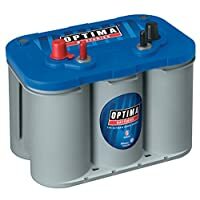 The battery is a product manufactured and sold by the Optima Company. It uses pure lead spiral cell design. The lead spiral cell design allows the lead to be used in the purest form. It has superior vibration resistance. It has increased durability and maximum plate height. A pure lead spiral cell design covers it, therefore, making the lead remain preserved for future use when it is still in its purest form. The spiral cell mechanism employed is for ensuring the cells are vibration resistance and extended life. The solid cast cell connections on it are for increasing durability and maximizing the plate height. One cannot sell the battery in the Catalina Island. The cells add vibrational resistance when tightly compressed. The 8027-12 has the best quality in all 50-60-AH batteries available in the market. 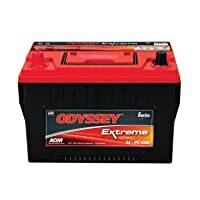 Buyers are saying it is a great marine battery, especially for the price. The 8016-D34M is the best dual purpose between all the 50-60-AH batteries available in the market. The item is also not for sale in Catalina Island. It is a 12-volt battery and can hold up to 750 Cold Cranking Amp. The battery weighs 43.5 pounds. It has an optimal starting power with regardless of inclement weather. The 8016-D34M can reserves a 120 minutes capacity upon consistent performance. The battery is a multi-purpose battery. It runs on a spiral cell technology. Which means this battery provides more running time and faster recharge. It has a tight wound construction that can reduce the risk of battery damage. Buyers are saying it holds up great and stay with Optima for years on end. 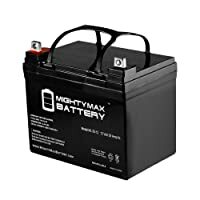 The product is manufactured and sold by the Mighty Max Battery. It is cheapest between the 70-80-AH cells and also a 12-Volt. It is group 24 sealed lead acid battery is rechargeable and maintenance free. It uses heavy-duty, calcium-ally grid. It is spill proof and has a high discharge rate, wide operating temperatures, long service life and deep discharge recover. You can mount it in any position, and resists shocks and vibration. It is a more advanced design and starts working right when it leaves the box. It does not require any maintenance. The battery is also rechargeable and spill-proof. The battery resists shocks and vibrations since one can be mount in any positions. It comes with a one year warranty and a backed 30-day refund policy, and the battery has a high discharge rate and a wide range of temperatures it can withstand. It is Ideal for boats. The battery is in group 24. It also has 8mm HEX screws in the terminals. The MR 107 is a 12-Volt battery and can hold up to 85Ah. The battery is said to have the best quality among all 70-80-AH batteries. It is maintenance free and has an average service life of 8-10 years. They have heavy-duty grids, constructed with lead-tin alloys that provide better performance and a longer service life. Another advantage about it is that it has carrying handles. The Electron Suspension system in VMAX tanks utilizes an electrolyte suspension system consisting AGM of a high porosity which absorbs and contains the electrolyte. The heavy duty grids provide an extra degree of performance and service their life by either float or cyclic applications regardless of the several repeated over discharges. The battery is maintenance free; in fact, there is no provision for this type of maintenance. The MR 107 has the best quality in all 70-80-AH batteries, you can go fishing all day long with it. 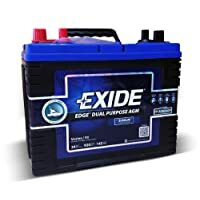 The battery is manufactured and sold by the Exide Battery Company. It is the best dual purpose 70-80-AH batteries. Its BCI group is 24. It has a reserve capacity of 145 minutes at 25A and also 775 Cold Cranking Amps. The battery is spill proof and has an AGM construction. Its the first and only batteries that feature Graphite Technology. It maximizes the energy capacity that aids in a longer higher level performance. This dual purpose battery has a non-spillable, AGM construction. Feedback from buyers are saying it’s a great battery for the price. It is a product by Optima Battery Company. The battery is also among the best dual purpose 70-80-AH cells and is in group 24. The battery is not for sale in Catalina Island. 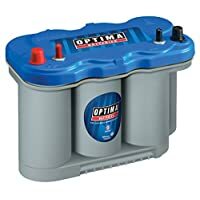 This dual purpose battery has the reserve capacity of 155 minutes.The Optima 8052-161 D31M has optimal starting power. That is 15 times more resistance to vibration for durability. The Optima 8052-161 D31M has optimal starting power even when there is severe weather. The battery is 15 times more resistant to vibration to enhance its durability. It is a 12-Volt battery with 900 Cold Cranking Amps. The battery weighs 59.8 pounds, and its stud posts are stainless steel. This battery is highly regarded. People are saying it can hold a long charge. They say it also holds up in warmer temperatures. The battery is manufactured and sold by Optima Battery Company. It is the best dual purpose 70-80-AH batteries. 34-PC1500T’s BCI group size is 34. This dual purpose battery delivers the best starting power and recovers rapidly. The plates contain virgin lead, unlike the lead alloy in most batteries. It has an AGM design that eliminates acid spills, and high conductivity. It has robust internal cell connections to prevent vibration damage. It is a 12-Volt, 900 Cold Cranking Amps battery and weighs 59.8 pounds. The battery has a reserve capacity of 155 minutes for consistent performance. It has an optimal starting power even when there is severe weather. The battery cannot be for sale in Catalina Island. Buyers are loving the Odyssey company. They are saying that it is an overall great battery. The battery is sold and manufactured by the Universal Power Group. It is a cheap deep cycle 100-125-AH battery. This non-spillable, sealed lead acid AGM battery has a group size of 27. 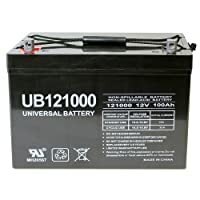 The Universal Power Group 45978 Sealed battery is a lot lighter than other batteries. You can mount it in any position. It gives enhanced strength and durability. It is a 12-Volt, 100 AH, sealed Lead Acid AGM battery. The battery is used mostly in Security, Medical Mobility, OEM, Solar, Emergency Lighting, Uninterruptible Power Systems, Electric Gates, and Medical Devices among others. Buyers are saying that it’s the cheapest battery they have found. They are also saying the quality is top-notch. It is the best quality among the 100-125-AH batteries. 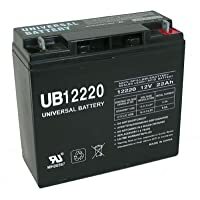 It is also a BCI group 31, 120-AH and a 12-Volt battery. The MR 137 has a Heavy Duty 12V AGM Deep Cycle Battery with Float Service Life Span of 8 to 10 years. Its Electrolyte Suspension system VMAX tanks utilize an electrolyte suspension system consisting AGM of a high porosity which absorbs and contains the electrolyte. There are no silica gels used. VMAX heavy duty lead provides an extra degree of performance and services their life by either float or cyclic applications. The batteries are also Maintenance Free Operation. The MR107 comes with heavy-duty lead-tin alloy grids. It is resistant to vibrations and shocks. It is also non-spillable and non-hazardous. Buyers are saying it’s worth the price. They are also saying it’s a powerful battery. The battery is the best dual purpose battery among 100-125-AH batteries. The battery has a Cold Crank Amp of up to 1150. It has a better warranty which is a limited 3 and 4-year full replacement warranty. The battery can give up to 3 to 10 years of life service. It has a fast recharge rate. It also resists vibration. The battery is a well-known extreme temperature tolerant. This dual purpose battery has a longer cycle life, faster recharge, and vibration resistance. It is the best rated dual purpose 100-125 ah BCI Group size 31 battery. Buyers are saying this battery is worth the price and that it’s very powerful and reliable. Other factors you can consider when purchasing a trolling motor battery. When choosing the correct weight of the battery you need, it is best to find one that fits your needs. If you are going to be transporting it a lot, a battery that weighs from 20 to 50 pounds is the correct weight for you. A battery that weighs 70 to 80 pounds is the correct choice when transportation isn’t necessary. The battery you buy for you trolling motor goes through constant amounts vibrations. Vibration is actually the primary cause of damage to your battery. The inner cells dislocate, which result in the deterioration of the battery. Most manufacturers are designing batteries that are more resistant to vibrations. If you get batteries that are resistant to vibrations, it will last longer. There are other battery accessories you can consider buying especially if your battery is for a boat. The advantage of buying these parts along with the battery is that one can get some discounts which can help save money. These accessories include items such as battery boxes, trays battery chargers (if rechargeable) and some battery and electrical cleaners among others. The accessories available are limitless, and one should choose them according to the battery they are considering to purchase. Remember the high cost does not mean that the battery is optimal and durable the less cheap ones could even be better. One should buy a good which affordable in his/her budget. Almost all batteries have warranties to ensure their well put up. There are many batteries with go for even more than five years warranty. You can also review the comments of other customers who have an experience with the equipment you want to buy. This is usually the last consideration one makes before purchasing a battery. The batteries can hold up charge for extended periods of time. They are durable because they are vibration resistors. Their only disadvantage is that while being used, they experience tremendous waves that could make the batteries sustain internal damages which cause poor functioning. 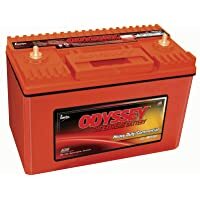 Deep cycle operations are appropriate for heavy duties and if a heavy duty gets to a typical fast cycle battery; it overheats or can even burst due to pressure. Therefore, an appropriate deep cycle battery is needed when taking care of heavy duties. More advanced batteries have heatproof since they have a design that allows proper cooling. Top class batteries have good constructions which prevent the chemicals in the battery from spilling. Being spill-prof makes it each to use the battery in any positions, especially for marine batteries. This is necessary for batteries since they are vulnerable devices. Always remember to recharge the battery it protects the lifespan of the battery. Storing the battery when discharged reduces its performance. One should never mix the types placed together during storage. If a wet cell in stored somewhere among batteries then the other batteries should also be wet cell batteries. Also never store an old battery with a new battery because the old one will pull down the new on. Wet cells require regular fluid level checks, always top off the battery with distilled water. Using distilled water prevents destroying chlorine in the battery by tap water. Remember to store the battery in a cool, dry and hook it to a trickle charge. If you do not use a trickle charge, then ensure to charge the battery monthly. Always keep the top of the battery clean and free from corrosion. If you notice signs of corrosion clean the battery using baking soda and water or simply with a brush. Whenever there is a 24-Volt, and the 36-Volt motor is being operated it requires two or three batteries. In such a case ensure always to connect the batteries in series; meaning that all the cells need to be attached to each other. When connecting, the positive cable from the motor is supposed to be appended to the positive terminal of the battery first in line. The last thing to fully connect the batteries is consecutively to connect the negative terminal of the first battery to positive terminal of the following battery. Buying a marine battery shouldn’t be hard or confusing. To choose the correct battery for your trolling motor all you need is some knowledge. If anything, I hope this article helps puts your confusion and stress aside and helps you find the right battery you need. Remember, once you find the right trolling motor battery, take good care of it. Never mix battery types, charge them up as soon as you can after usage, check wet-cell fluid levels every now and then and top-off as needed, check for signs of corrosion on terminal connectors and clean with baking soda and water. Also, store your batteries in a dry, cool place during the off-season and be sure to maintain a trickle charge.